Starting from Windows 8 the connection to the GPS receiver is no longer supported by COM Ports. Instead Microsoft developed what they call 'Windows Sensor and Location Platform'. This platform eases the connection to the many location techniques that are available on the device like Wi-Fi triangulation, IP address or GPS device. This is a quite new platform and a some hardware vendors support both modes. O ArcGIS Mobile 10.2 does no yet support this functionality which will only be available on the second quarter of 2014. 2. Install ArcGIS Mobile 10.1.1 with the ‘Location API Connection Extension for AGM 10.1.1’ provided by Esri. I have tested option 2 on two devices and it works fine. This extension does not work with ArcGIS Mobile 10.2. If you don't have this path on your device, just create it and copy the files. Don't forget to restart ArcGIS Mobile App. 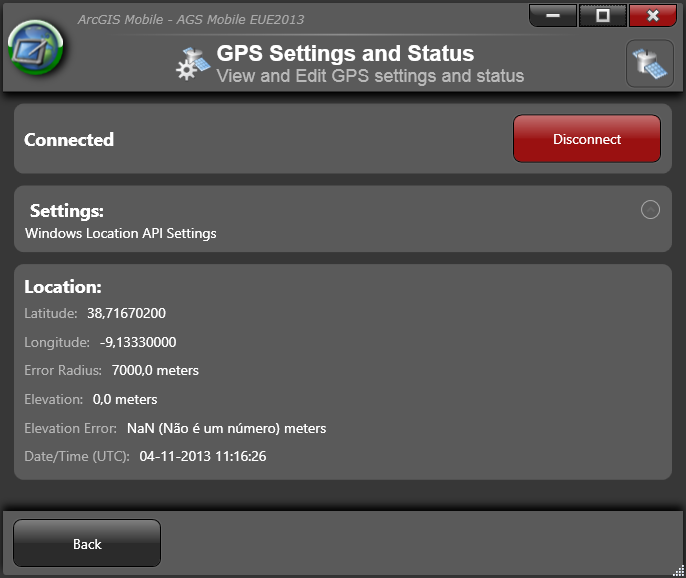 Then go the GPS Settings and Status and check the Windows Location API Settings. the GPS Settings and Status are ok but the location on the AGM map can't be seen. Any suggestions? Which of the scenarios are you using? Can you get a GPS fix and see the displayed coordinates on the GPS status window? I'm using scenario nr.2 and on the ArcGIS mobile GPS status window I can see connected and coordinates but the location on the map (Keep GPS in View) shows nothing. GPS cursor (green point) is blinking on the left corner of the screen and not moving.